Krishna Jamashtami is a religious holiday, that celebrates birth of Krishna. This holiday is observed in the Hindu countries, particularly in India, Nepal and Bangladesh. In India and Bangladesh this is a public holiday, and only religious holiday in Nepal. Krishna Janmashtami falls on the eighth day of the waning moon of Shravana month in the Hindu calendar. The day has no fixed date, that is why the holiday may occur throughout August and September. Krishna was the eighth son of Devaki and Vasudeva. After Krishna's birth, the Supreme God Vishnu ordered Vasudeva to take his son to other region, where he could live safely from his uncle Kansa, the tyrant ruler. 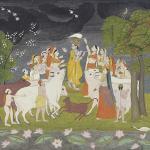 Vasudeva did so and returned back with Yasoda's daughter. Kansa thought, that the girl was Vasudeva's eights child and threw her on a stone. The girl rose into the air and warned Kansa about his death, and disappeared. When Krishna grew up, he returned to his hometown and killed Kansa. The Hindus celebrate Krishna's birthday by fasting and staying up until midnight. Images of Krishna are placed in swings and cradles in homes and temples. At midnight, devotees gather to sing songs, dance and exchange gifts.